Welcome to the web site of the Kanawha County Education Association of West Virginia and thanks for visiting! 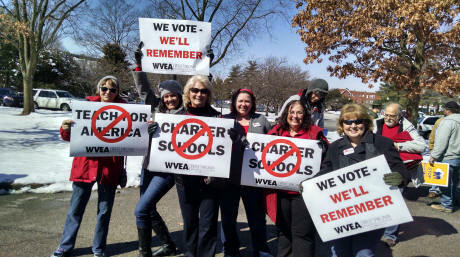 In rallies at the Capitol during the legislative sessions, KCEA members show their unity on important educational issues that affect our members. KCEA promotes measures to improve the working conditions of its members and to improve the education of the children of Kanawha County. As educators, we must advocate for our schools, jobs, and students. We are the voice of public education. This site is designed to inform KCEA members about what is happening in our organization. Becoming a member of the Kanawha County Education Association is easy! Simply fill out the form online and join hundreds of other educators and education support professionals in a unified voice on the issues that affect education today. Regular meetings are on the third Thursday of each month at the WVEA headquarters at 1558 Quarrier Street beginning at 4:00 pm. All members are invited and urged to attend. Building representatives from each school especially need to be present to take information back to their schools. Participate in YOUR organization. Let your voice be heard! We communicate directly with the KCS superintendent to make every attempt to address YOUR concerns. KCEA/WVEA is "by the employees/for the employees".